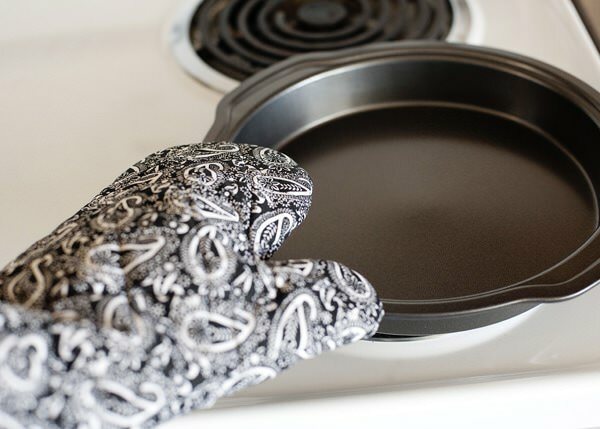 Today I am teaming up with Pampered Chef to Help Whip Cancer. 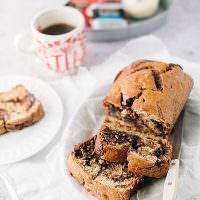 Pampered Chef is donating 25% of Help Whip Cancer® Fundraiser Cooking Show sales during the months of May and October to the American Cancer Society. Isn’t that reason enough to host a Pampered Chef party? 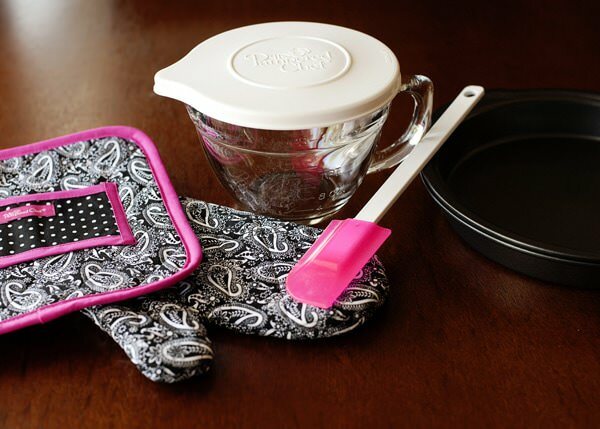 Pampered Chef is offering pink kitchen products and $1 from each sold will also go to the American Cancer Society. They also launched their Help Whip Cancer app this morning and are donating $1 to ACS for every “like” and “share” in May on Facebook! Today Pampered Chef and I are giving away (5) Help Whip Cancer gift sets. Want to talk about puffed pancakes? I love making pancakes for my family. They all love them, and I love making them happy. You know what doesn’t make me happy? By the time I sit down to eat my pancakes, they are all finished and ready to move on to something else. I saw this recipe in Midwest Living Magazine, and knew that it was the answer. You make one large, gorgeous, puffed beauty, and slice it like pie. It is a cinch to make, and less clean up than a normal pancake. When the pancake bakes, it forms a bowl, and it is the perfect receptacle for berries, bananas, sauteed apples, whatever strikes your fancy. This recipe works best if the eggs are room temperature. 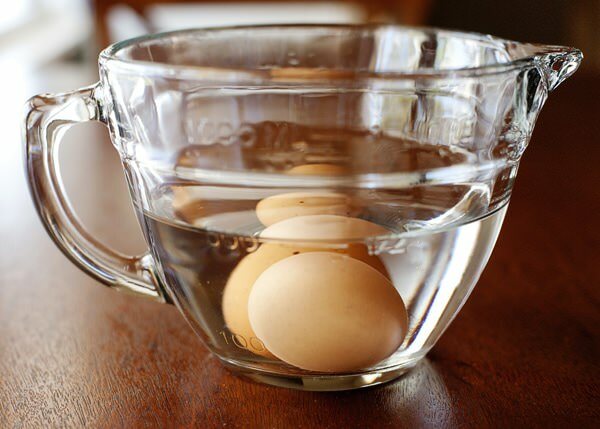 I never think about that when I am making this recipe, so I drop the eggs in warmish water for 15 minutes before, works like a charm. 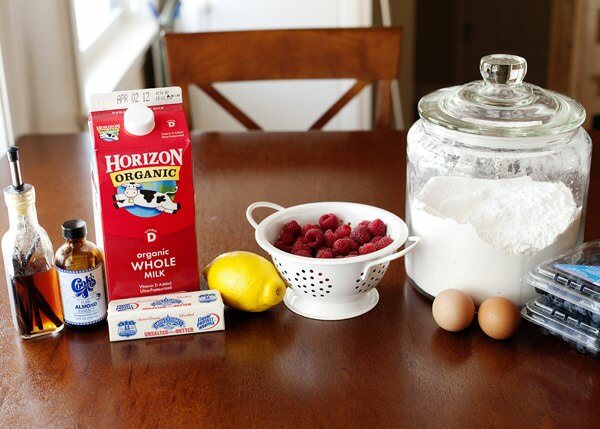 Add the eggs to a blender. Let it run for 30 seconds or so. 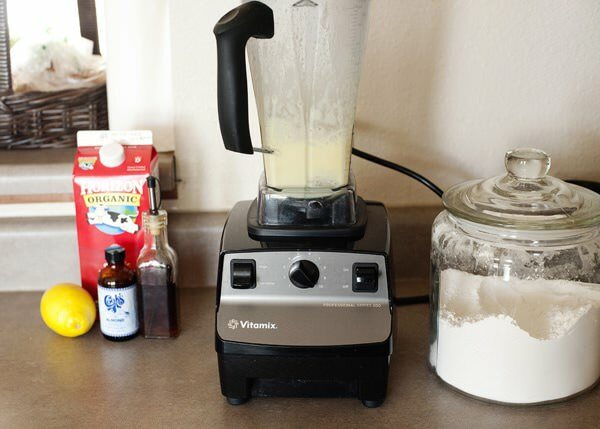 You can do this by hand if you want to, but I like how frothy the batter gets in the blender. 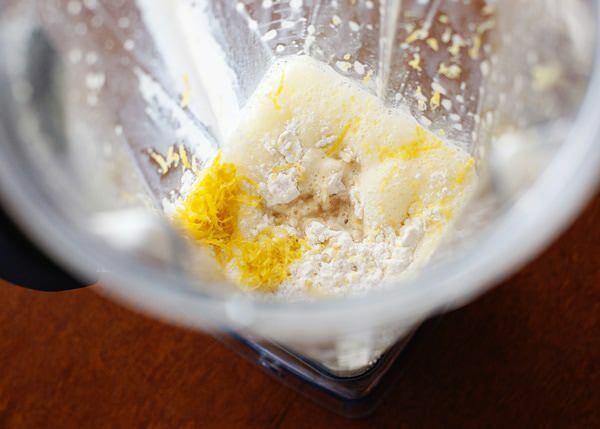 Add the flour, milk, almond extract, vanilla extract, and lemon zest. Blend again. 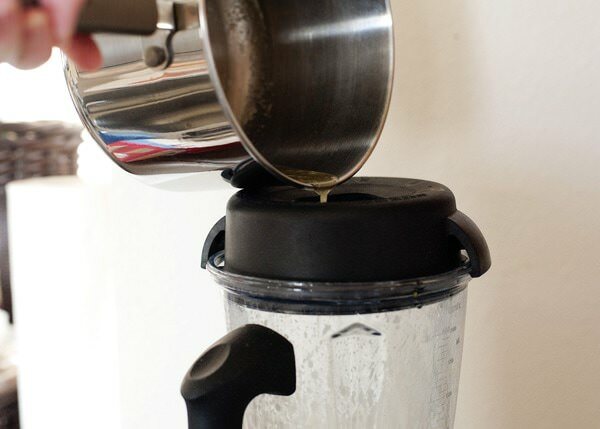 Pour 2 Tablespoons of melted butter into the blender while it is running. Take the pan out of the oven and add the rest of the butter. Butter the sides and bottom of the pan. 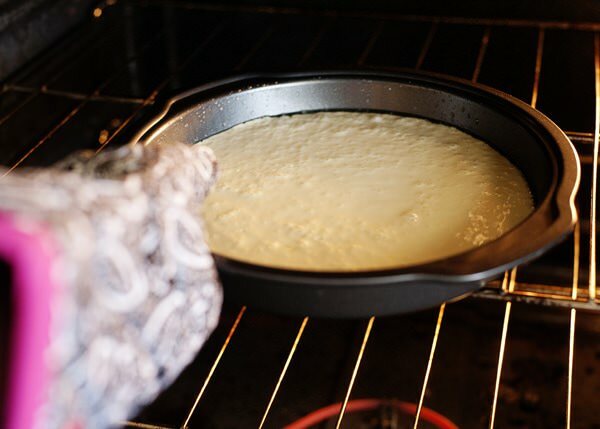 Pour the batter into the hot pan and put it back into the oven. After 15 minutes, it looks like this. Fill the center with raspberries and blueberries. Sprinkle with powdered sugar and a drizzle of maple syrup. Breakfast is served. AH! Pancakes are my favorite breakfast treat! I can’t wait to try this variation! What a great idea. I agree about getting done with the pancakes and everyone has left the table. I love an omelet loaded with veggies…blueberry pancakes…crispy hash browns – I just really love breakfast! I am now following your boards on pinterest. Can’t wait to try some of that delicious food! I love a good baked oatmeal, but baked a pancake sounds like the perfect commencement for cram-I mean, finals- week. Most mornings, I just eat some cheese and crackers. But, when I have time, I LOVE omelets with mushrooms and cheese, hash browns, toast, and tea. YUM! Most mornings I have toast with peanut butter & a small bowl of oatmeal. If I had it my way I’d have a bagel and cream cheese every day. I like waffles for breakfast! These pancakes look delicious! Lately I been making a sandwich using sprouted bread with a fried egg, whatever cheese i have on hand, and home made pesto sauce using roasted red pepper, Yum!! 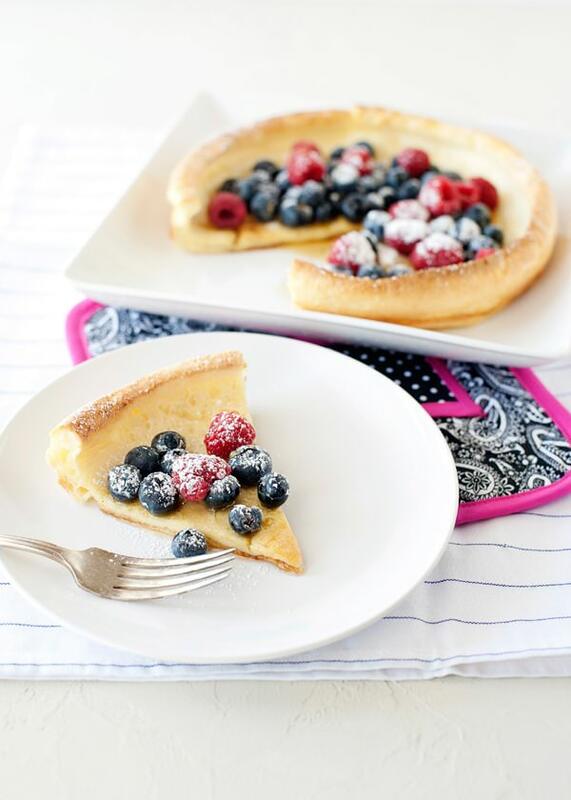 It’s sweet of you to work with Pampered Chef for a good cause! You have NO idea how long I have been looking for this EXACT recipe! When I was a kid, my friend’s aunt made a similar pancake and I have been wanting to try to make it myself ever since. So excited to try your recipe! Looks super yummy. I’ve loved everything I’m made of yours. I love a bagel with cream cheese. Though crepes are another favorite! The puffed pancakes sound wonderful and I can’t wait to try it! For breakfast I enjoy toast with grape jelly or if I have more time I make apple pancakes which are always a hit with my son! Missing my girls who are off at college because they would LOVE this breakfast. Fortunately, summer is coming! What do you think about making little ones in a muffin tin? I would love to spread the love. We love waffles but don’t make them too often. Like you said, by the time everyone else has eaten, I am just sitting down to start! Are these like a Dutch Baby? Breakfast is one of my favorite meals so I love all of it – breakfast tortillas, although where I live, we use lefse instead of tortillas, eggs cooked in every fashion, pancakes and waffles, egg bakes, scones with tea if I have the time to relax for a while, bacon with everything, etc. Great job Bree! Your puffed pancake looks really good. I’m going to try it!! My favorite breakfast is French toast with maple syrup and crispy bacon. Thanks for the great giveaway! Yum! These are so fun! Yum! I’ve never tried one of these before. I love the fruit topping though! 😀 Mmmm! Oh, and my favorite breakfast food has got to be waffles…with peanut butter, banana, and syrup. Mmm! Yum! I love having pancakes for breakfast! Will have to try this for sure! I love puffed pancakes! I think they’re so much easier to make than traditional pancakes. And they’re fluffier and dense at the same time. It’s an amazing combo. I love all breakfast foods…pancakes, french toast. omelets, quiche. I make something similar to this. 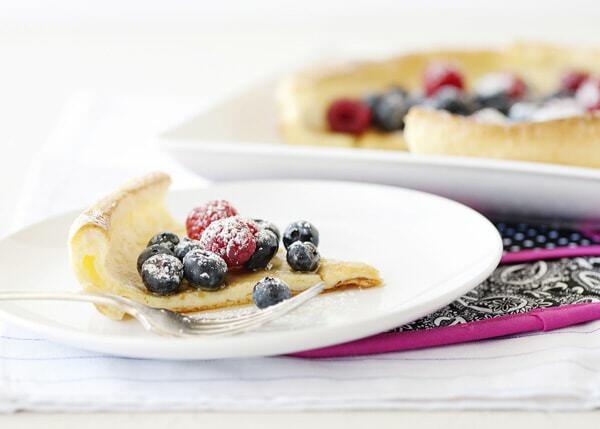 We call it dutch pancakes, and are so great, with that perfect shape to add any fruit or sweet. Mine are no so cute as yours, you have made perfection!! Love Quiche for brunch with a mimosa,of course! 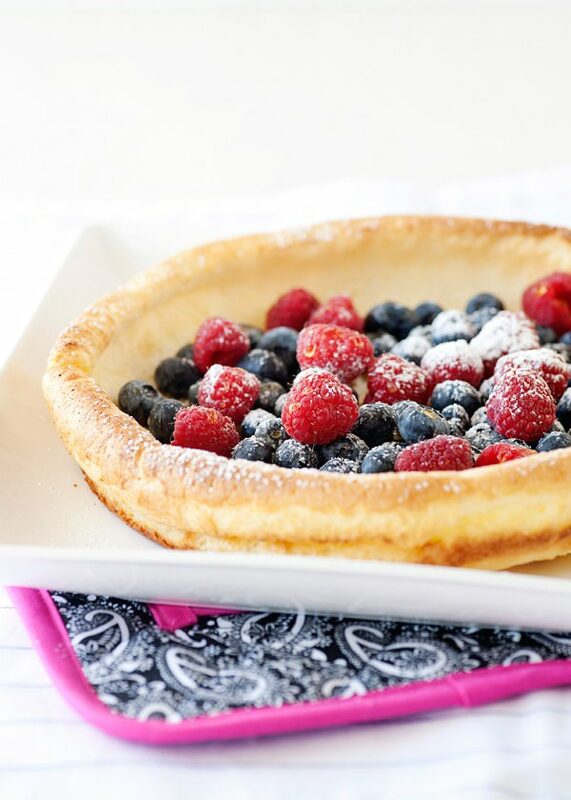 Next time family gathers for brunch I making these puffy pancakes filled with berries! Thanks Bree for the great recipe. My very favorite breakfast is eggs over medium and hashbrown potatoes. Piping hot cream of wheat, which my hubby makes for me every Sunday morning! LOVE!! French toast is my favorite breakfast treat. OMG I have wanted to try these, so I think I shall be making one this weekend. 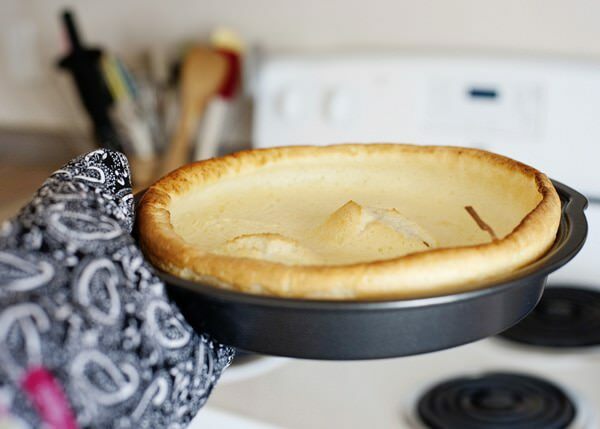 This is called a “Dutch Baby”. 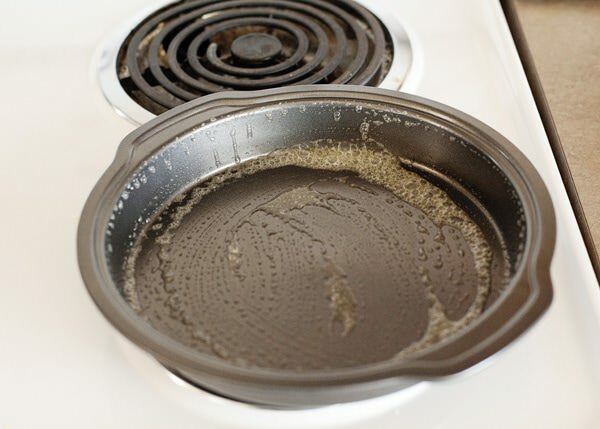 Melissa D’Arabian from Food Network has a very similar recipe. SOOOooooooooooooooo good! Love the idea of a community pancake! Can’t wait to share with my boys. Love this recipe!! Will be making it for my family this weekend!! Thank you!! I’ve always been a bit biased towards waffles over pancakes — the crsipy texture with the sweet syrup and fruit – -LOVE! On a regular basis, breakfast is usually hardboiled eggs and banana. Not nearly as exciting! My favorite breakfast is a skillet meal with scrambled eggs, crispy bacon, and shredded cheese! Coffee is my breakfast of choice! these look awesome! I can’t wait to try this at home with my family. My son is always asking for pancakes for breakfast. I am thinking that these would be good with Tastefully Simple Rhubarb Strawberry Fruit Spread. I am going to have to try this recipe soon. Yummy! This would be good as french toast also with some adjustments! Believe it or not–I LOVE cold pizza for breakfast but. . .I may need to change my mind after this! These guys look amazing! We eat pancakes a lot n that sounds like something I need to try because like you I never get to eat with my hubby n child. Thanks for the recipe! Used to go to a restaurant in Palm Dessert that served Puffed Pancakes. Would order them every time. Have looked for a good recipe for these for a long time with no real success. Will definitely try this one! My favorite thing for breakfast is usually a smoothie or an egg white on toast with avocado slices. My kids favorite things are pancakes. These will be perfect for my month “Baked Bree” brunch with family and friends!! Thank you so much for yet another fantastic recipe! Pancakes are my favorite, but I usually just eat oatmeal. I love puffed pancakes, but haven’t made them in awhile. I just may need to make some up for breakfast tomrrow!! I so agree with you in so many ways regarding this recipe! My family loves them too, and I hate that I never get to sit with them while they eat. I can’t wait to try this – it looks really delicious! My family makes something similar. It’s a big family tradition! I wrote a post about it here. So fun and so yummy!!! https://dearlylovedmist.blogspot.com/2011/12/pannukakku.html Thanks for the new recipe variation! What a fun looking breakfast! Beautiful food and looks delectable. I will definitely be adopting your recipe. I love your Pampered Chef partnership to Help Whip Cancer! What an awesome cause. 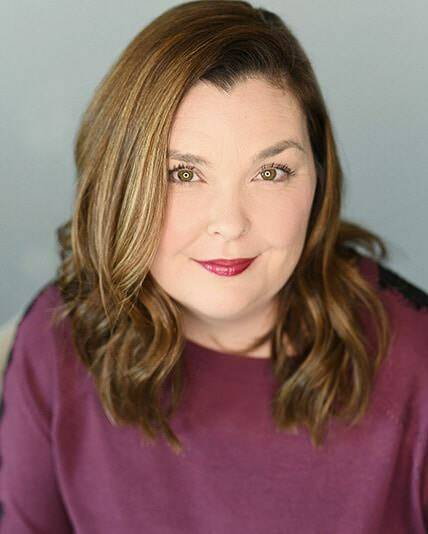 Just discovered your website and love it! I tried the puffed pancakes and they were awesome! I am so glad! Welcome! I just made these for National Pancake Day… YUMMY! Thank you so much! I just made these a few minutes ago and it was very fluffy…almost souffle like. Easy and a nice twist on pancakes. I did half the recipe just for me and used almond milk. It was sooooo tasty! I will make again!